Old Salem President James A. 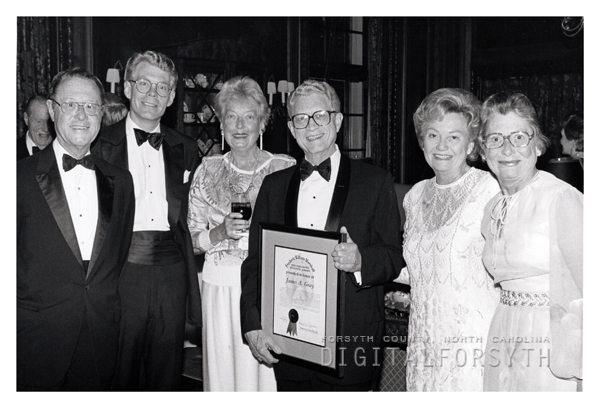 Gray receiving the museum’s Frederic William Marshall Distinguished Service Award on May 4, 1988. Flanking him (left to right) are his brother Howard Gray; son James A. Gray III; sister Christine Gallaher; sister Aurelia Eller; and sister Pauline Robinson. Old Salem President James A. Gray receiving the museum's Frederic William Marshall Distinguished Service Award on May 4, 1988. Flanking him (left to right) are his brother Howard Gray; son James A. Gray III; sister Christine Gallaher; sister Aurelia Eller; and sister Pauline Robinson.